List of Letters — Ginger writes. This morning I created a list of letters to write. Even though I've already written a dozen letters since the start of the new year, I still feel a little behind on my practice, as this stack of cards attests. Many need replies and some just need filing. Filing means adding them to my letter tower in the red cabinet by our table. One day, a couple years from now, I imagine myself sitting down with all these letters and reading back through them. I also imagine collecting all the Trader Joe's cards from their envelopes and creating a piece of wall art with them. I did make a photo album once of favorite cards, but it's in the garage in a bin. One day, also a couple years from now, I imagine me and TJ going through all the storage bins in the garage, finding things we'd forgotten. I'll pull out my card album and add new cards to the book, or I'll make a whole new book of favorites. I might fill an entire bin with all the leftover letters from all these years. 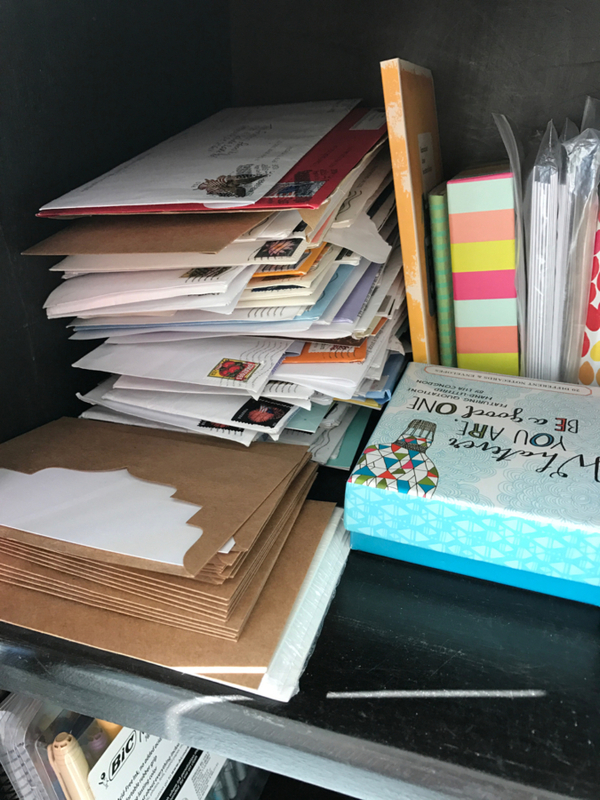 So many people who have given a part of their lives for me to keep, and so many happy trips back from the mailbox. So many moments standing in my kitchen to read a letter, but being in their kitchen at the same time. So many stamps, a whole collection in fact, and so many handwriting samples. So many "Dear Gingers," and so many details. So many different tastes in cards: birds, flowers, quotes, and whatever Trader Joe's has on offer. So many reasons that keep me writing letters back. It might take a little time to catch up, but I love the call to write, and now I have a list.